Six hundred people got K-State Fighting for a Cure shirts in 2015! That’s another $4,335 for K-State cancer research, bringing the total to almost $20,000! Oct. 17, Wildcats wore the shirts to the home football game and elsewhere in celebration of K-State Fighting for a Cure Day. First lady of K-State Football Sharon Snyder, university president and first lady Drs. Kirk and Noel Schulz, and many other friends showed their pride by wearing their shirts. 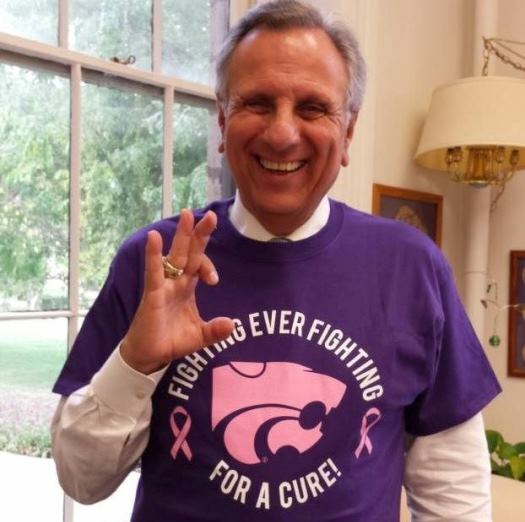 You can see photos of our shirt campaign supporters on Facebook, including former Wildcats and Chiefs football player Kevin Lockett, vice president for student life Dr. Pat Bosco (pictured) and director of bands Dr. Frank Tracz. A big highlight of the day was when the K-State Marching Band, decorated in pink ribbons, formed the words “BEAT CANCER” during their halftime performance (pictured above)! We also enjoyed hosting our annual tailgate party in Cat Town. We’re so grateful to N Zone and Varney’s for helping us sell shirts, to our media partners for promoting, and to many others who supported the effort! The 2016 Fighting for a Cure Day will be Oct. 8. Watch for a new shirt design! 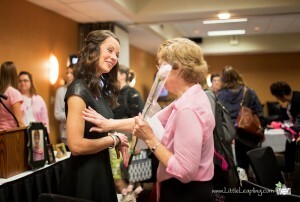 Our 6th annual Pink Power Luncheon for breast cancer awareness was Oct. 2 and bigger than ever. About 180 guests were treated to lunch and the moving presentation, “Not Your Grandmother’s Mastectomy: Journey of a ‘Previvor’,” by Jacque Groves, a local nurse who chose to have a prophylactic (preventive) mastectomy after learning through genetic counseling that she had a high risk of developing breast cancer. We thank Komen Kansas for supporting this event. View photos on Facebook. 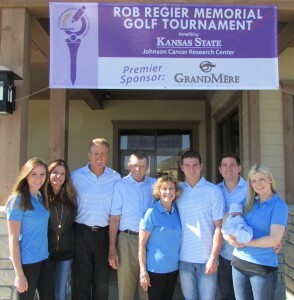 The 18th annual Rob Regier Memorial Golf Tournament was held Oct. 16 and raised $14,386! We thank and applaud Les and Sandy Regier for all their hard work and success on this longtime fundraiser! Prize winners and sponsors are listed on the tournament webpage, and we’ve shared photos on Facebook. Special thanks to Premier Sponsor Grand Mère Development! Our thanks to Sunny 102.5 Morning Show Host John Anderson for “raising the roof” for 10 years! 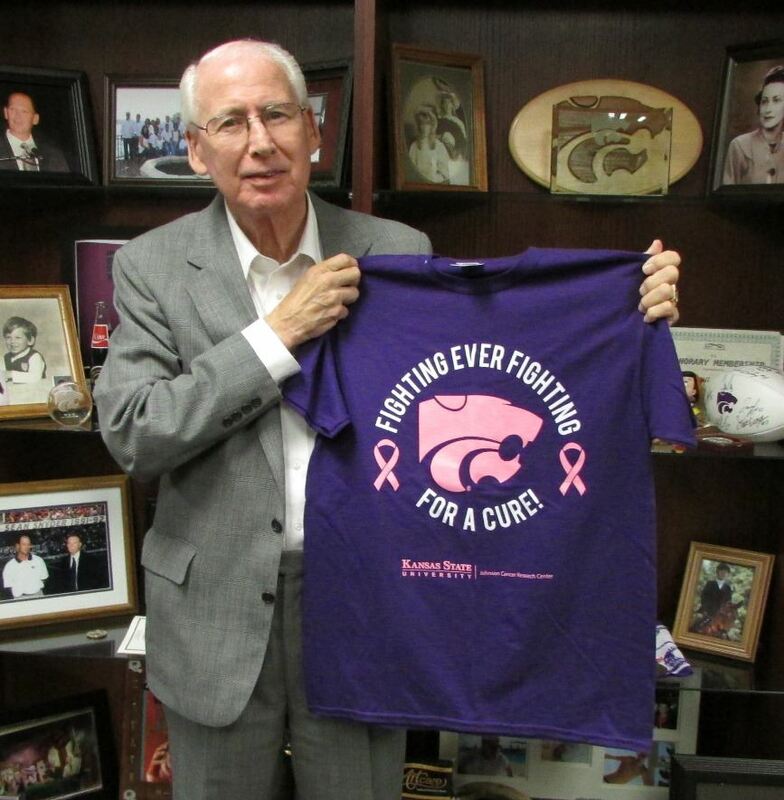 Once again, Sunny 102.5 FM and Oldies 98.5 FM asked their listeners to ‘Raise the Roof’ for K-State cancer research Sept. 18 as part of their and Coach Snyder’s annual Wildcat Challenge to Tackle Cancer. They took donations and auction bids all day while broadcasting live from the rooftops of McDonald’s in Manhattan, and raised $8,146! We thank Sunny and McDonald’s for their continued generous partnership!